I have some poor quality (cell phone)images of a clock I was recently given. 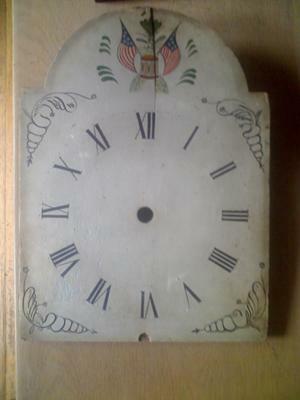 I would like any information you might have on the age,importance and restoration of this clock. It stands 90" and has no movement. The face has no holes for a key(s). The wood I think is pine and was built with long square nails in the frame. The only markings are on the back of the face in pencil, "No. 6 g bell" which I understand relates to the chime. Thanks if you have some information, it really is a good looking clock.